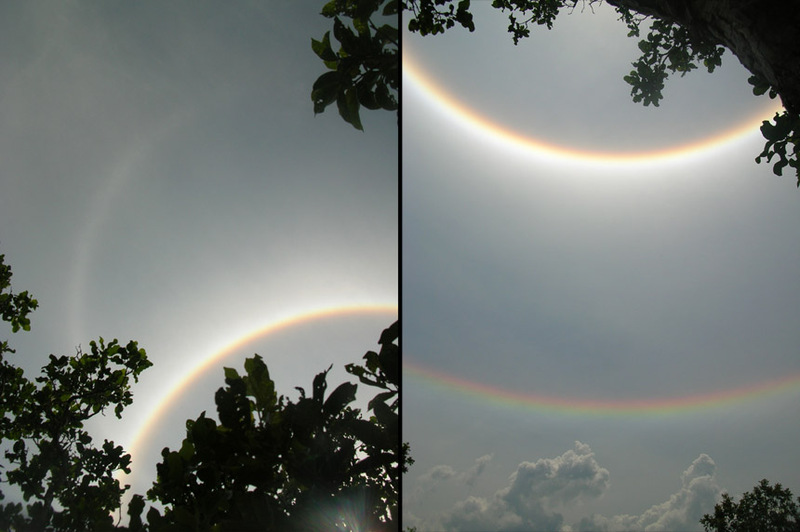 Louise Emmons sent these two photos of a halo display seen on 9 October, in Noel Kempff national Park North-Eastern Bolivia. The halos are a bright circumscribed halo, a probable 46° infralateral arc and parhelic circle. "It was one of the most amazing phenomena that I have seen in my life, together with a total solar eclipse with ground waves and an immense fireball", writes Emmons. The display lasted at least for half an hour. In about 6-8 h it was followed by a strong rain front. That's a winner. But how mediocre was the mediocre parhelic circle? And are there more photos? Can we simulate the entire display? Now there is added the other photo that Emmons sent. Haven't tried simulating.